We started our company because we know how hard it can be to find your way around the Scottish islands. Located off the north and west coasts of the Scottish Mainland, these are some of the most beautiful islands in the world - but they are not the easiest to explore. How can you find the best places to watch golden eagles or the most likely spots for glimpsing harbour porpoises? Where are the most stunning beaches or the most evocative abandoned villages? How do you find the best coastal hikes or the most rewarding mountain ridge walks? With our extensive local knowledge we will help you get the most from your island holiday. Whether you choose one of our specialist walking holidays or a day's customised guided walking, you will encounter spectacular island wildlife, evocative, long abandoned settlements and some of Europe's most stunning landscapes. Our tours are friendly and relaxed, with plenty of time for sight seeing, photographs and getting a feel for a place. Rushing around, after all, is hardly the Hebridean way…. Hidden Hebrides is owned and run by Mick Blunt & Alayne Barton. A qualified Mountain Leader, Mick has lived in the Hebrides for 17 years and has a fantastic knowledge of the islands' landscapes, wildlife and history. He worked as a professional environmentalist for 25 years, including spells with Scottish Natural Heritage and the National Trust for Scotland, as well as a 7 year stint as a countryside ranger in Stirling & the Trossachs. From 2005 - 2015 he was part time Western Isles Area Manager for the John Muir Trust, one of Scotland's highest profile conservation charities. Mick has been leading walking groups in the Scottish highlands and islands for over quarter of a century - and has enjoyed every minute of it! A keen walker for as long as she can remember, Alayne loves getting out to wild places - and living in the Outer Hebrides provides endless opportunity for doing just that. For 12 years she ran the Islands Book Trust, a small but dynamic local charity that publishes books on Hebridean culture and heritage, organises intrepid boat trips to uninhabited off-shore islands, and runs annual conferences on various aspects of the island's history. Alayne's infectious enthusiasm and fantastic knowledge of Hebridean heritage make her an excellent guide to these stunning islands. John spent many years exploring wild and remote parts of Scotland during his holidays, but when he eventually made it to the Outer Hebrides, he loved it so much he decided to stay! He is now living on a croft in a rugged but beautiful area of Lewis, and his ‘hands-on’ experience of Hebridean life gives visitors a real taste of what makes the place so special. ​Cheery, knowledgeable and unflappable, John is a superb guide. Eilidh MacLeod returned to live on the Isle of Lewis, where she was brought up, three years ago. Prior to that she lived in Glasgow, Inverness and the Isle of Skye, her mother’s place of birth, as well as in Spain, France and Vietnam. She is a Gaelic broadcaster and also runs a croft on the west side of the island. Walking is a life-long passion and she also enjoys running and Yoga with a bit of Zumba thrown in for good fun. She has a keen interest in local history and language as well as Hebridean wildlife. Isi has been guiding and instructing in the outdoors for 16 years, slowly moving north and west from her childhood home on the Isle of Wight. She has been living and working in Scotland for 14 of those years, and in the Outer Hebrides for the last 6. An island girl through and through, she has settled in Ness at the northern tip of Lewis, and now can’t imagine living anywhere else. A qualified Mountain Leader and rock climbing instructor, Isi enjoys getting on to the more vertical bits of our landscape, but hillwalking will always be her first love. 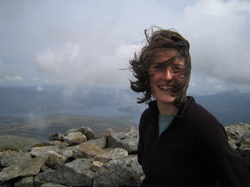 She teaches Hill Skills courses regularly and is also the Training Officer for the Hebrides Mountain Rescue Team, so suffice to say you can’t be in safer hands. Isi studied sustainable development via the University of the Highlands and Islands, and developed an interest in how the history and culture of the islands has resulted in the landscapes of today. She is learning Gaelic at the moment and will use any excuse to practice! ​David moved to Lewis in June 2017 from Peterhead, from the eastern most town in Scotland to about as far west as one can go! A recent new entrant to Crofting, with a passion for the outdoors, he has just completed an MSc in Sustainable Rural Development and is now lecturing in Sustainable Development in Stornoway with the University of the Highlands and Islands.